Beginning with the development of photography in the early 19th century, we as viewers have gradually embraced documentation as our most common (and oftentimes sole) experience of physical artworks. In relying on photographs, jpegs, videos, and renderings to encapsulate work otherwise inaccessible to us, however, we find our expectations of transparency in art documentation increasingly at odds with the inherent (and increasing) malleability of visual media. So as we look to these images to guide our perceptions and foster discourse, some essential questions arise: In an environment in which manipulation is ubiquitous, even expected, is neutrality effectively measured in degrees? 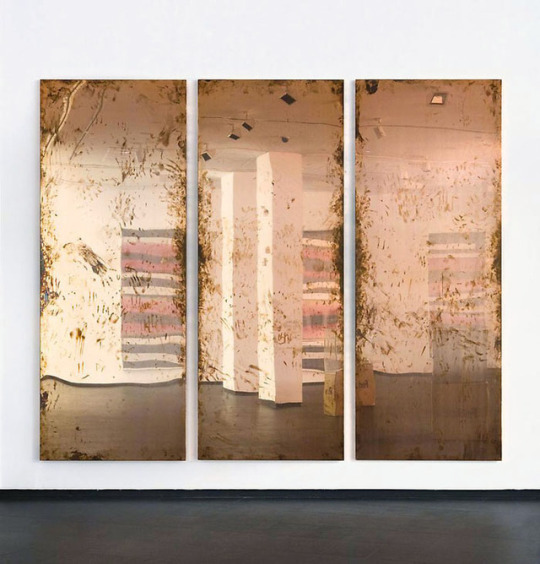 Can the presentation of artwork be at once mediated and objective? Representing the first chapter of a larger project examining contemporary art documentation, Installation Views explores these ideas by highlighting documentation images which operate firmly outside of convention. Through atypical vantage points, inventive lighting choices, playful integration of surrounding environments, and pronounced digital manipulation, these images lay bare the process of their creation, challenging presumptions of transparency by betraying the presence of the photographer to an extent rarely allowed in documentation imagery. In resisting standard strategies of idealization, these images reinforce for viewers the extent to which authorial intentions and purposeful interventions dictate a process so often presumed to be neutral, merely technical, and somehow separate from a depicted work’s “actual” meaning. Installation Views features prints of documentation by Elena Almagro, Clare Britt, Siv Dolmen, James Ewing, Gaylen Gerber, Jeremy Liebman, Shanaynay, Jan Tichy and Tom Van Eynde of artworks by Walead Beshty, Jan Tichy, Andreas Ervik, Roxy Paine, Mateo Tannatt, Gaylen Gerber, Ryan Gander, A. Laurie Palmer, Conrad Hamather and Dana Carter. Jimmy Limit: I wanted to talk a bit about ‘Installation Views’. We have been talking about the photographer as a sort of neutral figure that documents things in a straight-ahead fashion. This is true in product photography, real estate photography, museum artifact photography, and arguably in the documentation of art exhibitions as well. When you were putting together this show of unconventional art documentation photos, I had to really think about if I had any of those myself, because I had always been in that sort of technician mode, although it has affected the way I now document shows. The way you approached it almost made it seem as though it was an unspoken – or unknown to the artist whose show it was – collaboration. Christopher Schreck: One of the central ideas with ‘Installation Views’ was that the documentation process is an inherently transformative and thus creative act – like any other commercial product photography, it almost necessarily involves some degree of idealization, the resulting depictions straying to some extent from the physical realities of the objects being depicted. We tend to think of documentation photography, including and particularly in relation to artworks and exhibitions, as a culminating gesture, almost an afterthought, but it’s really about creating a separate work that lends itself to a separate viewing experience. It ends one narrative while beginning another. In speaking with numerous documentation photographers about it, what became really interesting to see was that while the process does amount to a kind of collaboration between the photographers and artists, if anyone’s unaware of that dynamic, it seemed to be the photographers, who were generally adamant in characterising their input as technical rather than transformational. They’d readily acknowledge the amount of intervention and post-production involved, but because those decisions tend to be dictated by convention rather than personal creativity, they didn’t see the process as being at odds with the presumed neutrality of documentation imagery. For Sofia and me, this raised some really interesting questions: namely, in a climate in which manipulation is so pervasive, even expected, is neutrality effectively measured in degrees? JL: That is quite interesting. Take something like electrical sockets: these are really inconspicuous things when you are in the actual space, but they stick out when you view the images. Removing them is a simple task in Photoshop, but then how do these compare to install photos of previous shows where they have not been edited out? Do become less valid to the viewer? Another issue is that more people now see documentation of shows online than see the actual show, so the documentation becomes the final say of the installation. If something was different in the actual show than in the documentation, it is rare that they will acknowledge this. They are more likely to question the accuracy of their own memory and assume that the photograph is the correct version, even though it has probably been heavily edited in Photoshop. CS: Well, like Szarkowski pointed out, we always give more credence to images than to our own perceptions, simply because the image survives the event, and over time gradually replaces it in our memory. It becomes the remembered reality. But as you said, that’s assuming we’ve even directly seen the work or exhibition to begin with, whereas art documentation’s function has generally been to provide accurate depictions of items not readily accessible to us. To me, just the fact that we’re so comfortable allowing images to stand in for physical artworks is pretty intriguing – especially in the context of today’s visual culture, which is informed to such an extent by the malleability of static imagery. At this point, most of us have developed a healthy skepticism towards the images we encounter; we’ve generally grown less inclined to presuppose their credibility. And yet, when it comes to art documentation, we still seem comfortable basing our perceptions and opinions of artworks on these mediated images, even when we know from experience how different their depictions can be from the physical reality of the work itself. There’s this willful suspension of disbelief that seems to take place, which Sofia and I found really intriguing.